Pretty much everything that is (hopefully) useful, practical, and relevant which I can tell you about this wonderful Thai ingredient has been said in my post on how to use Nam Prik Pao in modern Thai cooking. 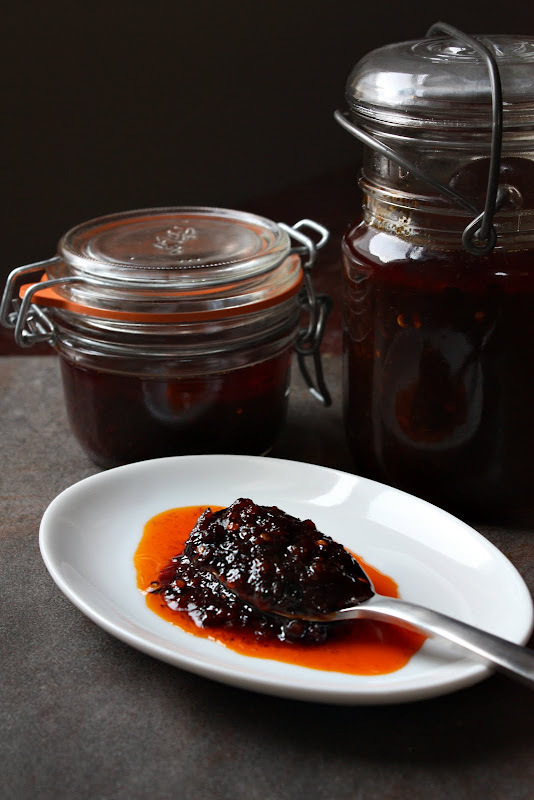 And since I will not go into its historical background (as the purpose at hand is to create the kind of Thai chilli jam that is used in contemporary Thai cooking), the only thing left to talk about is how to make this versatile condiment at home. The following two methods of making Nam Prik Pao are what I have been using. Both have their pros and cons. This method yields a smokier, “nuttier” jam the taste of which resembles that of commercial Nam Prik Pao except it’s fresher and more flavorful. The “jamming” stage takes less time due to the dehydration and caramelization of the garlic and shallots caused by pan-frying. It takes no more than 20 minutes over medium heat for the mixture to become loose jam which thickens up further upon cooling. This method yields the kind of Nam Prik Pao that is the most versatile. It can be used in Tom Yam, stir-fries, etc. It’s terrific as a bread spread or a dip for fish skin “chips” or fried pork rinds whereas the result of the other method is, in my opinion, more limited in its usefulness (details on that below). Pre-fried ingredients result in a drier, more powdery paste. The mandatory hand-slicing of the garlic and shallots is tedious and time-consuming. These ingredients need to be cut into uniformly thin slices to facilitate the process of pan-frying; this cannot be done in a food processor. 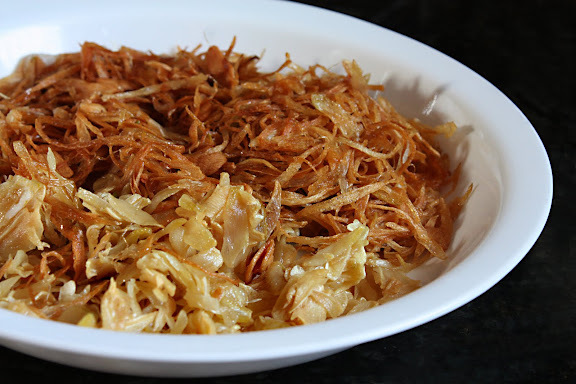 To ensure even cooking and minimize mess, you may even want to follow what Kasma Loha-unchit has suggested which is to leave the sliced garlic and shallots out to dry a little before pan-frying them. Once dehydrated, they fry up more quickly and brown up more evenly without much oil splattering. While that’s helpful, it also presents an extra step. From my experience, making (or telling people to make) Nam Prik Pao this way seems to bring all sorts of critics out of the woodwork. Even my paternal grandmother insisted Nam Prik Pao wasn’t made this way. 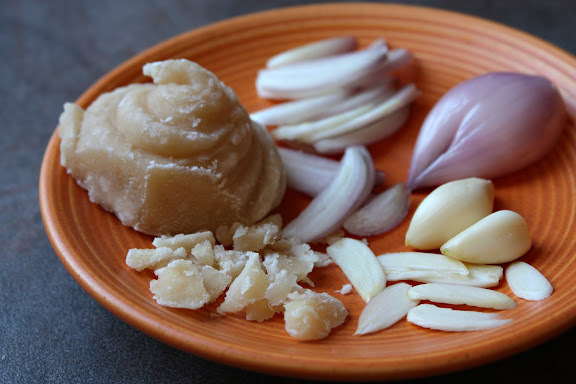 You just have to be prepared to explain to them that your main objective is not to recreate the historical Nam Prik Pao — whatever it might look like and however it was made — but to make the kind of condiment that is known in the here and now as Nam Prik Pao and used in contemporary Thai cuisine. To achieve that kind of Nam Prik Pao, you need to make it this way. Garlic and shallot slices are fried separately until light brown and crispy. The second method (favored by my paternal grandmother) requires the roasting of the key ingredients. My grandmother would put whole garlic cloves and shallots on the skewers and roast them over low coals or an open flame of the stove until they’re soft and slightly charred. The shrimp paste would be wrapped in a banana leaf packet and roasted in the same manner. The dried chilies would go into a skillet and get dry-toasted until they crisp up and become just slightly blistered on the outside.2 Then everything would be pounded together in a mortar and fried in oil. Preparing the ingredients by roasting instead of frying them is the way my grandmother had been taught to do. 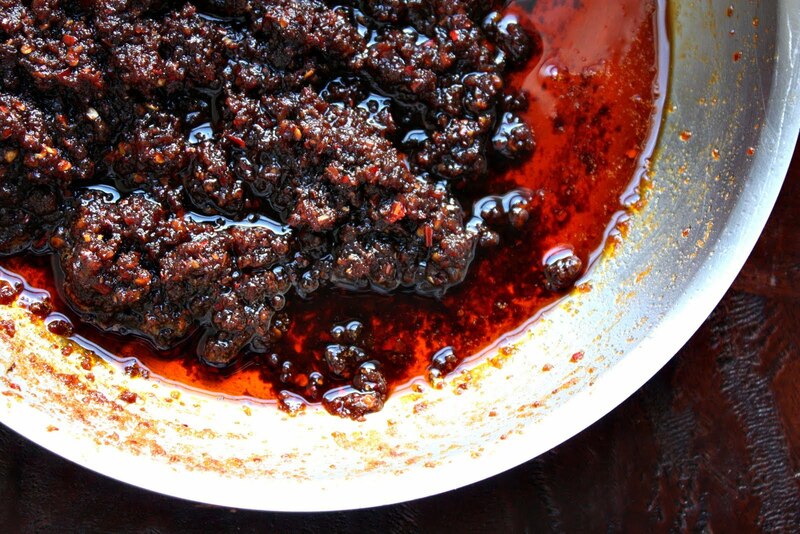 And if she was here today, she’d most likely give you a lengthy treatise on how it is precisely due to the roasting of ingredients that this condiment has come to be referred to as Nam Prik Pao, literally roasted nam prik (chilli paste or chilli relish). Though this makes a lot of sense, I can’t prove or disprove it. Actually, I’m not sure I’m interested in either. 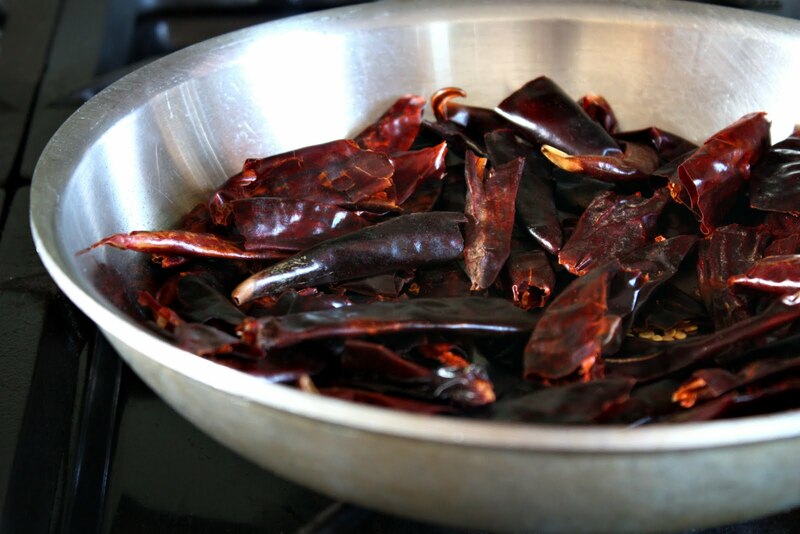 Dried chilies are pan-toasted just until fragrant and brittle. Care needs to taken not to burn them to prevent Nam Prik Pao that is dead on arrival. You don’t need to slice anything manually; you don’t need to pan-fry anything either. This shaves off more than half of the preparation time and significantly reduces the number of greasy things to wash.
Roasting the ingredients is pretty easy and results in less mess than pan-frying. You end up with Nam Prik Pao that’s terrific to serve mixed with rice and as a chili relish. It also works great in stir-fries and Tom Yam. For these applications, Nam Prik Pao derived through this method serves you well (see its limitations in the Cons section below). Slosh, slosh. When ingredients are roasted instead of fried, the paste is wet. Nam Prik Pao made this way, in my opinion, lacks the depth of flavor that is achieved through the caramelization of the ingredients through pan-frying in oil. Nam Prik Pao made this way doesn’t make such a great bread spread. If I hadn’t grown up spreading my bread with commercial Nam Prik Pao, I might have loved this. But since that’s not the case, Nam Prik Pao made with the second method presents an unfamiliar taste as a spread. 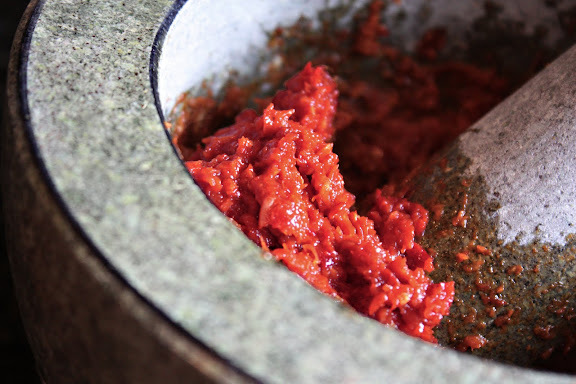 Without the caramelization and dehydration of the main ingredients (achieved through pan-frying), things get sloshy in the mortar and when grandma asked you to pound the paste in a mortar, you’d get cranky. After about half an hour, you’d get bothcranky and spattered with chili paste. For the same reason stated in the previous point, the mixture, being so wet, takes much longer to reduce to jam-like consistency. Also, the end result never gets to be the familiar mahogany color; no matter how long you fry it, it never gets darker than dark terracotta. Choose whichever method works best for you. Or try both and decide which you like better. But if you know that you really, really like the flavor of commercial Nam Prik Pao, I’d suggest you go with the first method. Both methods employ the same ingredients; they’re just prepared differently.Please note that the measurements, except for the liquids, are in metrics. This is because measuring these ingredients in cups and spoons has yielded inconsistent results in my many experiments. Besides, I’m assuming that those who care enough to make Nam Prik Pao from scratch most likely own a kitchen scale. 34g deseeded dried red chilies (Thai long peppers or arbol chilies) – Make sure you weigh the chilies after they have been stemmed and deseeded. The amount of seeds you add back into the paste when you grind it determines the level of heat. More seeds, more heat. I like my Nam Prik Pao medium-hot, so I add 50% of the seeds back into the paste. Cut the garlic cloves and shallots lengthwise into uniformly thin slices. Separate the two. Spread them out on two cookie sheets to dry a little. Heat up about ½ to ¾ cup of vegetable oil (this amount of oil is in addition to the ½ cup of oil that will be used later to fry the chili paste) in an 8- to 12-inch fry pan over medium heat. Fry the garlic and shallot slices, separately, until light brown and crisp; set aside. Do the same with the dried shrimp; set aside. In a dry skillet over medium-low heat, toast the dried chilies until they have changed their texture from somewhat rubbery to somewhat brittle. Be careful not to burn them. In a granite mortar or food processor, pound or grind all the garlic, shallots, dried shrimp, and dried chilies into a fine paste; set aside. Put the paste and the remaining ingredients, including the ½ cup vegetable oil, in a shallow and wide pan set over medium heat. Cook everything, stirring occasionally, for about 15 minutes until everything has dissolved and you get a fried paste that is thinner than commercial Nam Prik Pao. Check for consistency. If the paste is still too thin, reduce it some more over medium heat. When you have achieved the desired consistency, store your Nam Prik Pao in a clean glass jar. No need to drain off the oil. The Second Method: On a fine grate over a grill (or under the broiler, on low), roast the shallots, garlic, and dried chilies until the shallots and garlic are soft and slightly charred and the chilies brittle. (These things roast at different rates, so it’s better to roast them separately.) 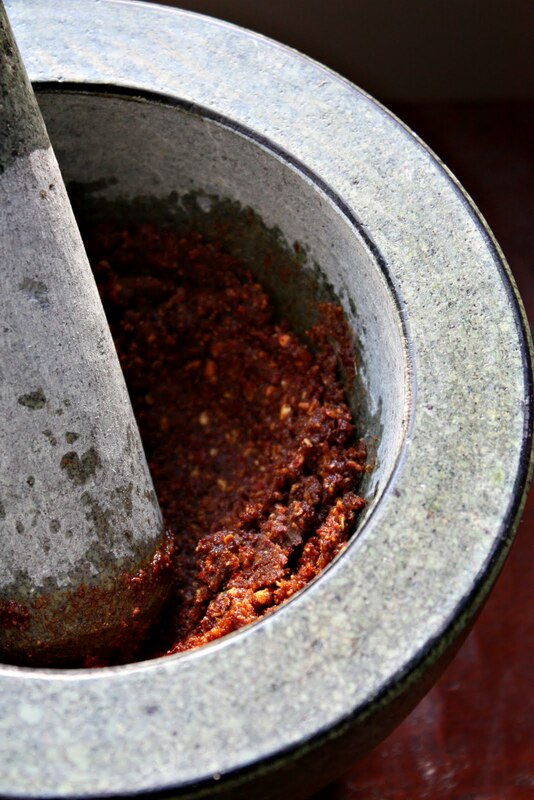 Grind or pound the roasted ingredients into a fine paste using a food processor or a granite mortar; set aside. Wrap the shrimp paste with a piece of banana leaf or a piece of foil and roast it over an open flame on the stove for 2-3 minutes; set aside. For the second method, follow these instructions: In a granite mortar, pound the dried shrimp into flakes (or use a coffee grinder as instructed here); set aside. Put all the ingredients into a wide and shallow pan and fry over medium-high heat for about 30 minutes, stirring occasionally. You know you have reached Nam Prik Pao consistency when you can make a 3-inch hole in the middle of the paste and the hole keeps its shape. Remove the pan from heat and let the paste cool completely before storing it in a glass jar. No need to drain off the oil. I’ve been reading your blog for a while and am so heppy to have have found it and be learning so much about thai cooking. Can’t wait to try this! I’ve only ever done it the first way. Great to read the comparison! OHMYGOD, i’m so over the moon at discovering your blog after a hunt for a good Coconut sticky rice with mango recipe! Big fan of chilli too, this looks so yummy, thank you! Leela, I’ve been waiting for this post! Thank you! I have a question about dried shrimp in any recipe. What do you do to get the shells off? Do you not care? Pound them up in the mortar and just toss it all in? Or shell them by hand before you pound them? brillsec – Forgive whose ignorance?! Come on. I never shell dried shrimp. Thai-style drie shrimp has already been shelled most of the time. All you have to do is throw it into a granite mortar and pound it into flakes. Some recipes call for whole dried shrimp in which case no grinding is necessary. However, I’ve noticed that sometimes dried shrimp isn’t shelled, especially if it is made according to Chinese or Latin American tradition. But for this recipe, whether your dried shrimp comes with or without shells, you don’t need to d anything. Just grind it up as is. You made me want to go into my kitchen and make them all. Looks so good!! Great post Kha! Thanks! Can’t wait to get some peppers and try this. My family has loved everything I’ve made from your blog. Thank you so, so much for posting how to make sauces, etc. I live 1.5 hrs from the nearest Asian Market, and rely heavily on what I can whip up from ingredients already in the pantry or freezer. Have sent hubby looking for Nam Prik Pao twice, and gotten back things that did not at all resemble this! I have been looking for nam prik pao for a while and now I can just try making some! I absolutely love your blogs. I recently moved to Germany (miles upon miles away from my Thai mother) and I never realized how much I would miss her cooking and advice on what I was doing wrong. I never wrote down any recipes and I regret it; I will definetly take a journal and write down EVERYTHING she tells me when i go to visit. love the blog. amazing pics and your writing is really informative. interested to understand why you say the fried NPP isn’t good for dtom yam, stir fries (salad dressings?) etc. is it that you dont like the fried taste – too strong? too oily? Andy – Thank you for the kind words. Thank you very much also for asking the question as it made me go back and re-read what I’d written only to find out I was as clear as mud. I’ve modified a few things to make it clearer. I wouldn’t have caught it without you bringing up the subject. The first method wherein the ingredients are fried yields a more versatile NPP that can be used in anything where you normally use NPP. The second method, though less time-consuming and less labor-intensive, is good mostly in Tom Yam and stir-fries but not so good as a dip or spread where it flies solo. My opinion. Thanks again, Andy. Appreciate you dropping by. I’m currently IN THAILAND and have access to vats of nam prik pao, but it’s the thing I love so much here that I’m preparing for the inevitable when I go back home to America. I don’t consider this being obsessive, just prepared! Pad prik pao gai with a fried egg makes my life complete – I could eat it all day, everyday, and be a very happy person. Actually I’ve been combing through your blog finding all of my favorite things that I’m eating right now in preparation for life not in Thailand. I’m so thrilled to have found your blog! It’s entertaining and informative and is actually making me EXCITED to tackle Thai cooking on my own! cleared it up a treat – thanks Leela. I never knew the roasted one was the original but totally makes sense (because of the name like you say, but also my understanding is that grilling things is as more ancient cooking method than frying). I think they’re both great! Also I’m sure i’ve tasted a grilled version which hasn’t been then fried out (i.e just pounded, seasoned then used – as a dressing for a chicken and roast banana blossom salad in this case). didnt speak enough thai to find out for certain though! Justine – You’ve made me so happy! Enjoy your time in Thailand. Andy – Thanks. The grilled version was actually a staple in our household; we used it mostly to “kluk” the rice with. I’ve been looking for this for 10 years! No store bought brand is the same as I used to get in a tiny Atlanta restaurant. This recipe is even better with a the strong roasted flavor I prefer. First time I made it I was a bit lazy with seeding the chilies. Only added a few back to compensate. It was so hot it brought tears to my eyes. I had to give away to some Indian friends of mine who can handle it – lucky them. My second batch I seeded carefully and did not add any back. It is still 4/5 stars of heat, which I can handle but would prefer about 3.5/5 so I can use more for the flavor. I used dried chilies imported from thailand. Do you think arbol chilies from a mexican grocery would be a little milder or are they essentially the same? Douglas – I think arbol is a tad milder, but that could be my imagination. Try using the same amount of large Thai dried red peppers if you can find them. The larger ones are much milder. You can also use guajillo chiles in a pinch. Those are milder too. I already thought to look for larger chilies – milder and easier to seed, but my asian mkt only had small. Now a guajillo would be 100 times easier to seed. Might be worth trying just for the time savings. I really like your site and I’m very interesting in making Nam Prik Pao. I’m growing Thai chilies in my garden and I found your site when I Googled “Thai chili recipes.” I had one question, though: Since I’m growing my own chilies, can I use them fresh or should I dry them first and then follow one of your recipes? I have access to a food dehydrator so drying them wouldn’t be a problem if that yields better results. Thanks and great job on the site! Mark – Thanks! You have to dry the chilies to achieve NPP’s signature smokiness. 1. Using crushed or powdered dried chilies makes sense as it’s just a way of cutting down on the time you would spend deseeding the chilies. What I don’t like about that, though, is that you don’t get as much smokiness out of it. When you dry-roast the dried chili pulp (no oil — you toast/roast them in a dry skillet), not only do you get them to become brittle and easier to grind (untoasted chilies are rubbery) but you also add the subtle smokiness to the dish. You could try to get the smokiness by toasting powdered chilies. Just be careful not to burn them. In my opinion, a big advantage to preparing your own dried chilies instead of using pre-ground dried chilies is that you have more control over the amount of pulp and seeds that go into the dish. The pulp creates body; the seeds determine the level of heat. With crushed or powdered chilies, you don’t know the ratio, and the level of heat varies from brand to brand. 2. I don’t really see the point of hydrating dried chilies only to dehydrate them again, especially if you’re going to fry them in oil. 3. Ditto with dried shrimp. I fry dried shrimp when they’re still dried. They become caramelized, crunchy, and very easily to pulverize. 4. Yup. Add the water to the paste before frying. This allows time for the flavors to meld together while the mixture is being reduced. Adding a paste of caramelized ingredients (assuming you’re using the first method) to the oil without additional moisture makes the paste more susceptible to burning and developing bitterness and has proved to cause the end product to become too sticky, too fast before the flavors have a chance to meld together in the pan. Eventually, that one cup of water will entirely evaporate, leaving a loose oily paste that will thicken to perfect consistency once left to cool. It took me a while to go through my spicy double batch. So in the effort to make a slightly milder batch I used about six large new mexico chilies and a dozen or so thai chilies. This turned out to be fairly medium in heat but still had a great flavor without the tedious seeding of the small chilies. Now that I can do versions really hot and a bit too mild, I should be able to get the mix just right next time. Fantastic recipe! So much flavor and not nearly as sweet as the stuff in a jar. I love it. The preparation is a bit time-consuming, but once you’ve got everything ready, it goes quite quickly. I’m planning on making a huge batch and give it to people around the holidays. What can be substituted in place of the shrimp, and shrimp paste? I eat kosher, so I am unable to consume shellfish, but yet I would love to try making this, were there a kosher alternative (sardines or anchovies, maybe?). Ashley, absolutely. The shrimp paste is there for flavor more than anything, so mashed up canned anchovies (drained, rinsed, dried with paper towel) would be an acceptable substitute. The dried shrimp, on the other hand, is both for flavor and texture, so the best substitute for it in this recipe would be Asian-style dried anchovies (they look like this). Should be easy to find at a well-stocked Asian store. I’d pay attention to the level of saltiness which both the canned and dried anchovies bring to the recipe. You may have to adjust the amount of fish sauce. Thanks for posting this recipe! I made a batch last weekend (following method no 1) and I’m pretty pleased with the result. I made two little changes though. I toasted the shallot rings in an oven at 175 C/350 F with a bit of oil added on a piece of baking paper. My oven isn’t fancy by any stretch of the imagination but I get a much more consistent result if I use the oven instead of frying them in a pan and it requires less attention from the cook. Just check how they’re doing every 5 minutes or so. When they’re done, turn on the grill for a couple of minutes to char them a bit. The second change I made was adjusting the amount of garlic to 40 grams because I used store-bought, toasted garlic flakes instead of sliced fresh garlic. That seemed a lot easier 🙂 . The correct amount is a guess though. I went for 2/3 of the weight you recommended when using fresh garlic, simply to compensate for the loss of water because the flakes are dehydrated already. This may need some adjustment though. I may go for 50 grams or so for the next batch I make. It tastes great the way it is now, but a bit of extra garlic wouldn’t hurt 🙂 . I just made this recipe using method #1 and it was well worth the extra effort. I used it in a coconut milk based dressing for a grapefruit and shrimp salad and it was good as a condiment to add a little extra heat to my curry, but I am really looking forward to letting the subtleties of the nam prik pao stand on their own over a friend egg and some rice tomorrow morning. Thank you so much for the great detail taken for your Nam Prik Pao recipe. I have one question: Your recipe calls for 1 cup of water, but I don’t see the use of the water on the instructions? I love Nam Prik Pao on many things, but my favorite is on dark chocolate, it’s fabulous! Margaret – I’ll have to try NPP on dark chocolate someday. Water is added in step 6 where it says to add the remaining ingredients. Sorry about that, I see where you write add “remaining” ingredients… I was not use to seeing water added to the recipe, so I was looking for the word “water” in your instructions. I also see in your later post that you explain the use of the water. Thank you! So, having made both types, and also managed to find a commercial example, I can say that A) I *way* prefer the ones I make. The commercial one tasted preservative-y and a little sythetic and B) I like method one more. And if I may add a C) I curse that I have spent 33 years of my life with a jar of this in the fridge. Many thanks! Hi, Leela, I love your site and have just started with some of the !marvelous! recipes. But I have to note here (as a dedicated chile-head),that the SEEDS of the chiles do not contain the capsacain that gives the heat: the majority of the heat is actually in the placenta (the membrane to which the seeds are attached) and not in the seeds themselves. If you grind up a bunch of seeds, all you get is a woody-tasting and uninteresting paste….by personal experience. Thanx for all your wonderfull teachings…..family and friends love the stuff I make from your blog. Mike – Thank you! I guess the reason the paste is noticeably hotter with more seeds is because the seeds have contact with the placenta, yes? I stumbled across this recipe while looking for a way to use up the massive bag of dried chillis I’ve had in the back of the cupboard for a couple of years. It didn’t say what variety of chilli they were, only that the country of origin was India. They’re very similar in size, colour and shape to the ones in your image above though. Anyway, I followed the recipe to the gram and the final product definitely has a delicious flavour, but it’s also possibly the hottest thing I’ve ever put near my tongue. Even a tiny dab sets your whole mouth on fire – and I’m not usually shy about spice in my food. Is there anything you can recommend to make it less spicy? Or any uses for a hella spicy version of this jam? Chris – Yes. Different peppers rate differently in the Scoville scale. In other words, two different types of the same weight will give you different levels of heat. Since I don’t know what types of pepper are available in your area, the best thing to do is to consult the Scoville scale. Anything in the 2,000-5,000 would do here.